KANSAS CITY, Mo. (AP) — Patrick Mahomes walked out of Los Angeles Memorial Coliseum two weeks ago with his jersey stained, his pride no doubt wounded and an uncharacteristic five turnovers blighting his box score. The only thing he stewed about during the Kansas City Chiefs‘ bye week was the final score. The three interceptions that he’d tossed in the 54-51 loss to the Rams, and the two fumbles he lost trying to escape trouble, were merely learning opportunities. Mahomes went to work on the Chiefs’ bye week dissecting what went wrong, where he can improve and how he can avoid making the same mistakes. The big knock on him coming out of Texas Tech — besides the fact that he was a product of the much-maligned “Air Raid” system — was that he was prone to turnovers. The Patriots’ Tom Brady has six games with four interceptions during a career that will likely land him in the Hall of Fame. Ben Roethlisberger once tossed five for Pittsburgh against Jacksonville. The difference in some of those dismal days by some of the NFL’s best quarterbacks? They didn’t also throw for nearly 500 yards with six touchdown passes in a game that they nearly won. 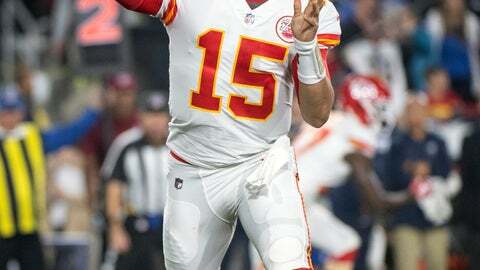 “You don’t hide it,” Chiefs coach Andy Reid said, when asked how he approached the performance by his young quarterback. “You go back and evaluate it. How did those things happen and how do you fix them so they don’t happen again? We’ve done that. The one thing about Pat is he doesn’t make the same mistake twice. That’s been his M.O. here. I’m not worried about that. NOTES: DL Chris Jones was voted AFC defensive player of the month. He has nine sacks total, and at least one in each of the past seven games. … WR Sammy Watkins (foot) remained out of practice Thursday. Safety Eric Berry (heel) and C Mitch Morse (concussion) continued to work on a limited basis.